Smartphones are a part of our daily lives now. We use them to make calls, check our calendars, our emails, find out the time, or even get the weather. Sometimes just glancing down at your smartphone turns into staring at your phone to the point where you ignore everything and everyone around you. Social media can make you get caught up in what’s going on online rather than around yourself. Instead of looking at pointless Internet memes or photos of cute kittens, take in life around you. If you are one of these people that have a difficult time of breaking away from your smartphone, you might just be suffering from smartphone syndrome. This has social and physical side effects so it’s good to get detached now. If you spend countless hours looking at screens, it’s likely that you suffer from smartphone syndrome. Our bodies aren’t designed to continuously put our necks and back into a strain from looking at a computer screen or a telephone screen by leaning forward. However, this is becoming a part of life. It can show up with symptoms including neck and shoulder pain from the overuse of the phone. You might also have pain in the wrists, forearms, and hands if you’re a texter. One way to fix this is to assess your posture to see if you might be suffering from smartphone syndrome. Are your shoulders rolled forward and you’re hunched over when you walk? If so, you might just be a victim of smartphone syndrome. 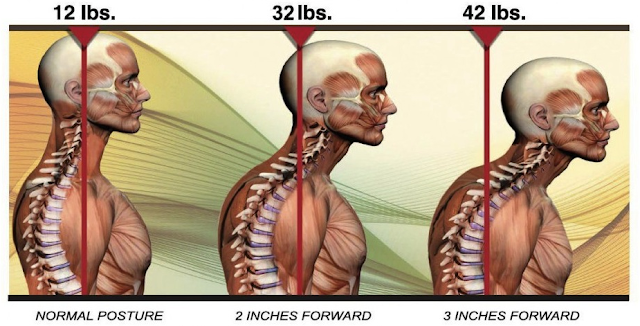 Check yourself in a mirror or ask someone you trust to see what your posture is like. Use these tips to help fix yourself before you wreck yourself. Cutting yourself off of your smartphone or computer is almost unavoidable. However, there are safer ways to do it. Rather than craning your neck downward to look at the screen, try to get it as close to eye level as you can. Don’t worry about looking awkward. No one you know cares about your health more than you do so who cares what you look like when checking your phone? Use some daily exercises that can reverse the adverse effects of excessive cell phone use. These exercises will help to stretch and strengthen the shoulder and neck muscles. Do chin tucks and just press your shoulder muscles backwards, look ahead, and press your head backward. Hold this position for several seconds. Another exercise is to stand against a wall with your feet out slightly, bending the knees slightly. Take your arms and put them against the wall, bending the elbows to make a “W” shape. Push your shoulder blades together and this can help undo that hunch you might be getting in your posture. Utilize hands-free devices to talk. Just a small little headpiece can let you continue your conversation without tilting your head to hold your phone between your shoulder and ear. Get a good massage from a massage therapist. They are familiar with good posture and if you tell the therapist you’re trying to fix the results of too much cell phone usage, they’ll focus the massage on the upper back, neck and hands.